Sony’s previous efforts in the true wireless earbuds space have been pricey but generally quite good. Even in a category that’s still young and open to challengers, they’ve offered up some of the most technically-impressive and polished options out there. And, at first blush, the new Sony WF-SP900 true wireless earbuds look set to continue that trend. Where the previous SP700s had some of the best noise-cancelling you can find in the true wireless earbud category, the SP900s promised to bring Sony’s true wireless proposition into line with the competition when it comes to features. Previous Sony earbuds distinguished themselves through noise-cancelling. The new ones add on-board storage, swim-friendly water resistance and better battery life to the equation. Unfortunately, after a few weeks of messing with these earbuds, it’s clear these exciting additions have come at a cost to the everyday experience as well as affordability. Battery Life: 3 hours per charge, 9 more on charger case. 12 total. 6 hours of playback per if using on-board storage. In terms of aesthetics and form-factor, the SP900’s feel like a natural extension of what the previous SP700s were trying to accomplish. 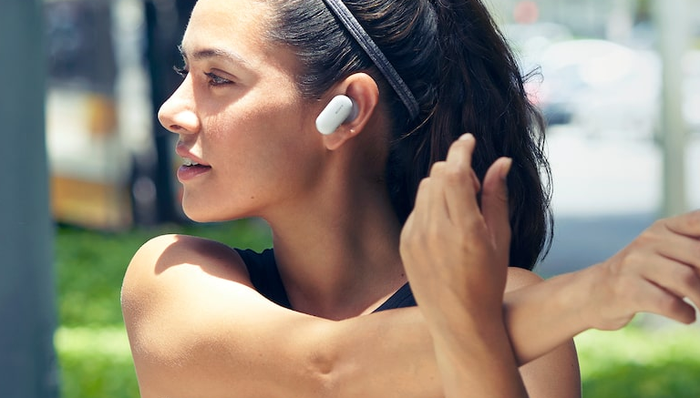 They’re true wireless earbuds that’ll do the trick for any sort of workout - even swimming. Across the board, they’re very similar to their predecessors in look and feel. They’re a little bulkier, to be sure, but they’re also a lot more ergonomic. The earlier SP700s weren’t uncomfortable to wear, but they were sometimes a little finicky to actually put in your ears and even more unintuitive to stow away inside their charger case. The SP900s addresses both of these shortcomings in strong form. Overall, they’re still more of a hassle relative to fare like Samsung Gear IconX or Jabra’s Elite Series but a definitely improvement nevertheless. Skipping back to the headline feature: Yes, Sony went made a set of wireless earbuds that work underwater. Traditionally Bluetooth signals can’t actually pass through water. However, if you’re using the on-board storage in the SP900s to listen to your music, you can start a song and then continue swimming uninterrupted. It’s something that no other set of headphones can really offer you - and that’s neat. Really neat. Really. Performance - How Do The Sony WF-SP900 Compare To The Competition? But whether it’s $500-worth of neat is going to depend on just how desperate you are to listen to music while you swim. Because if you’re not planning on swimming with these in, then it's going to be a hard ask. When it comes down to it, the SP900s aren't all that exceptional without this aquatic hook. Listening to music and podcasts through these proved decently audible but little else. In my experience, there wasn't much depth to the sound nor weight to the bass. As far as everyday headphones go, they're good enough. But that's just it. They sounded fine, and when you're trying to justify a $500 asking price that's not really good enough. Audiophiles are going to better served by Sennheiser's Momentum TW earbuds and everyone is probably going to prefer the better battery life available from the Zolo Liberty+ earbuds and the other options on the table. As with other Sony wireless headphones, you can configure the connectivity of the WF-SP900s to prioritize either sound quality or connection quality using the Sony Connect App. However, that's not the only app that the SP900 rely on for functionality. I initially found my music playback was constantly overwhelmed by outside noise with these headphones. Out of the box, the experience was so bad I honestly thought I had been sent a faulty pair of headphones to review. I later learned that the volume control for the earbuds is contained in altogether separate app. This resolved the issues I was having - upgrading the listening experience offered by the SP900s from terrible to not-so-terrible - but it's borderline-ridiculous that the master volume controls for these headphones are located in a second app. At a glance, the Sony WF-SP900 look to do exactly what the WF-SP700s did: build on the strengths of past Sony true wireless earbuds. Unfortunately, somewhere along the line, something has gone awry. Sony accomplished their goal of offering true wireless earbuds that you can swim with but little else. They’ve won the battle but lost the war. 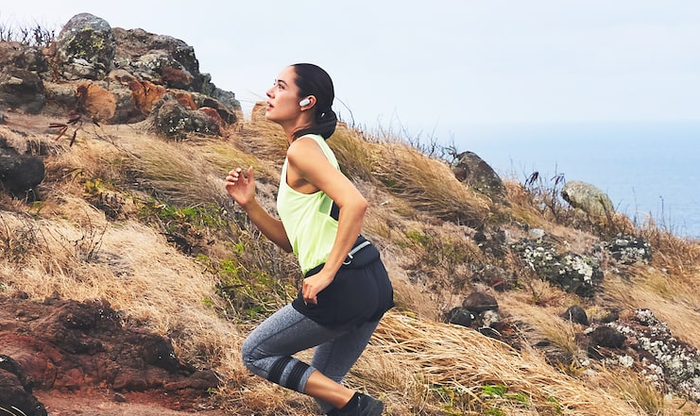 Unless you’re religiously drawn to the idea of true wireless swim-buds - the Sony WF-SP900 true wireless earbuds are a disappointment worth avoiding at all costs, never-mind $500.